I guess I should confess. I am mean and cruel and I beat not only my students but Jenny's as well. 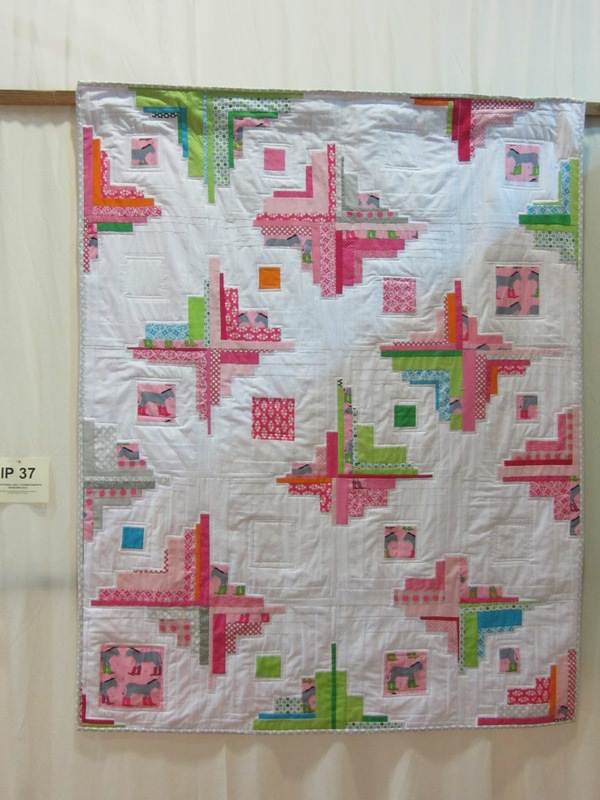 I've been trying for years to get more people from Patchwork Corner to enter quilts into the Sandown quilt show, partly because it's a really nice show and partly because there are a lot of good quilters there. It also seems daft not to enter when most of them go to the show anyway and entering gets you a ticket. In the past one or two students have given it a go, and enjoyed the experience, this year was the best yet, with 8 quilts from the shop. This was helped a lot by the charity category. 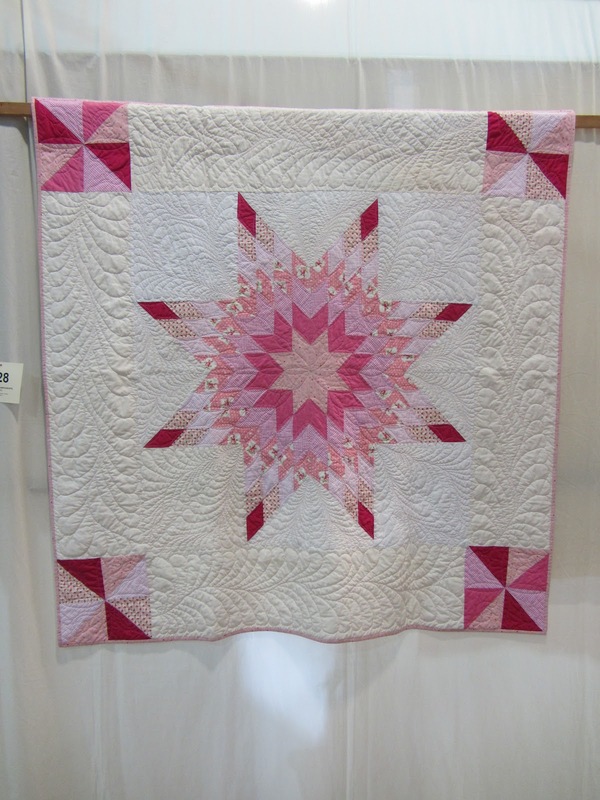 All the entry fees for quilts in the charity theme (In the Pink) were donated to Breast Cancer Care, it was a win win situation. 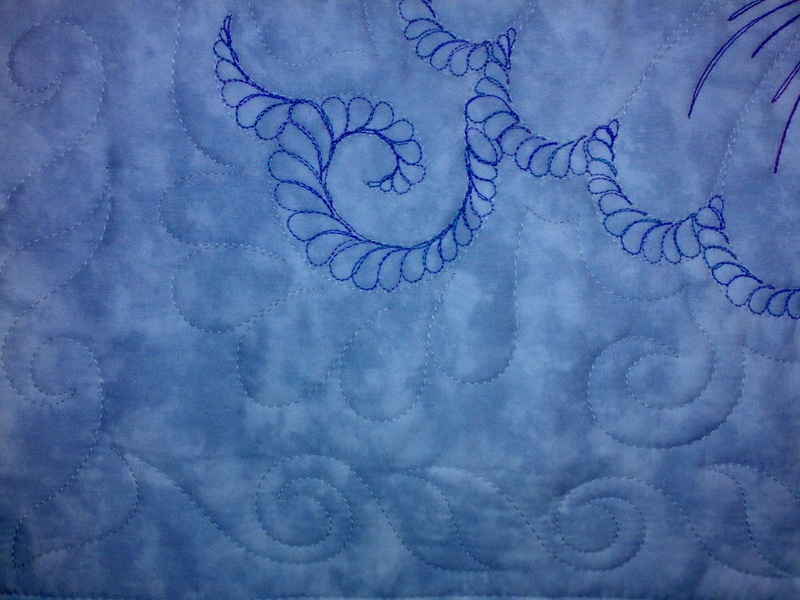 So on that note the first quilt I am sharing (with permission) is a small wall hanging. It was made by Karen Benge from a McKenna Ryan pattern. 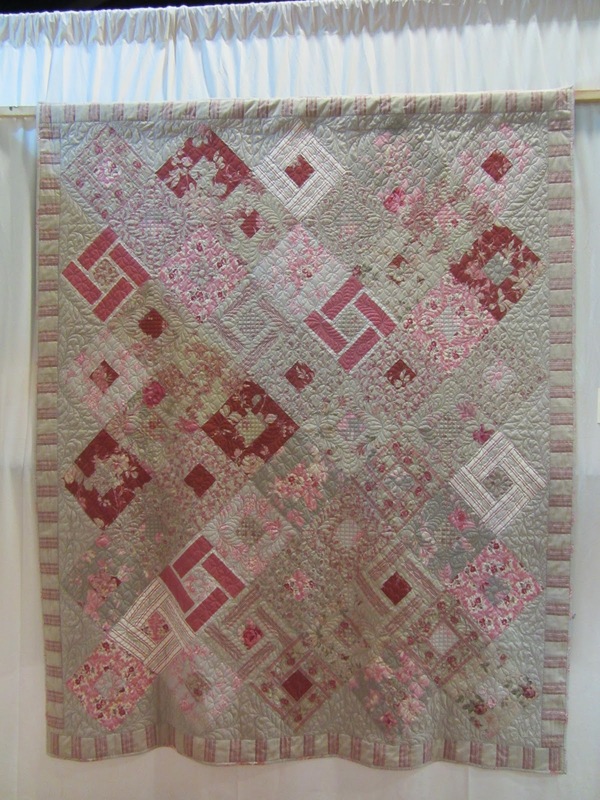 It's a lovely quilt and the picture doesn't do it justice. The quilt on the washing line is a separate little quilt and there are real pegs. It's scary to be responsible for it, but worth the effort. The next quilt is a group entry. Unfortunately groups were not allowed to enter the theme category, but it wasn't obvious from the entry form. Looking at the show guide, there were a few groups who didn't spot that restriction and there was a larger then usual group category. 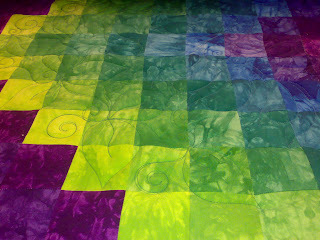 Again the picture won't show you the half of this quilt made by the Thursday Morning Ladies. 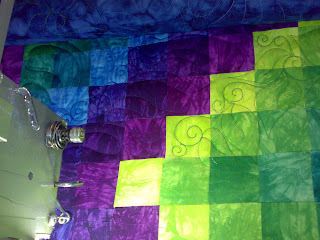 The blocks are very effective and were a great choice for a group project, but the detail in the machine quilting is mad. Do try clicking on the photo, but I don't think the tiny hearts will show. 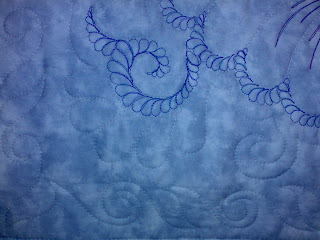 This was Jill's first attempt at machine quilting on a frame, brave or what? She did a good job and learned a lot. I love finding new frame quilters, they get all the fun little problems that you don't even think about until they happen to you. 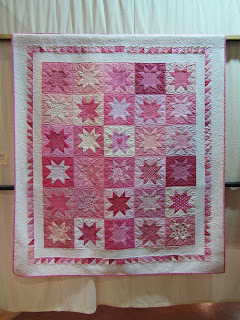 This quilt will be raffled for Breast Cancer Care, I'll let you know about tickets when I find out about them. 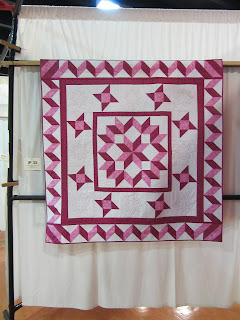 The next quilt is by Liz Norton, one of my Thursday night ladies. As soon as we knew the theme it was clear this quilt had to be entered. What I didn't realise until I saw it hanging was how good it is. Just look at how well it hangs. I wish I knew how she did it, I would love all of mine to look that good in a show. Another quilt that really pleased me is this one by Carolyn Meggison. She recently joined myWednesday morning class 'to learn machine quilting'. She meant it too, and her dedication is paying off. Those feathers are completely freehand and sewn on a quite basic little domestic machine. Watch out for the name, she has picked up machine quilting a lot quicker than I did and is rapidly soaking up not only everything I can teach her but all sorts of things she finds on the internet. I don't know how she got the lone star done so fast and to the standard, I only know I didn't teach her it. I can't wait to see what she enters next year. Ah, now this one is really cool. This is from the boss herself, Jenny. 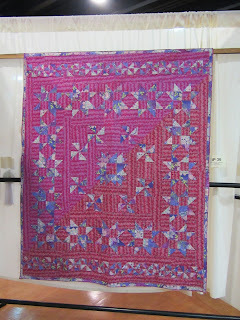 It was made as a sample for a new range of fabrics but then she realised it was pink and thus could come to the show. 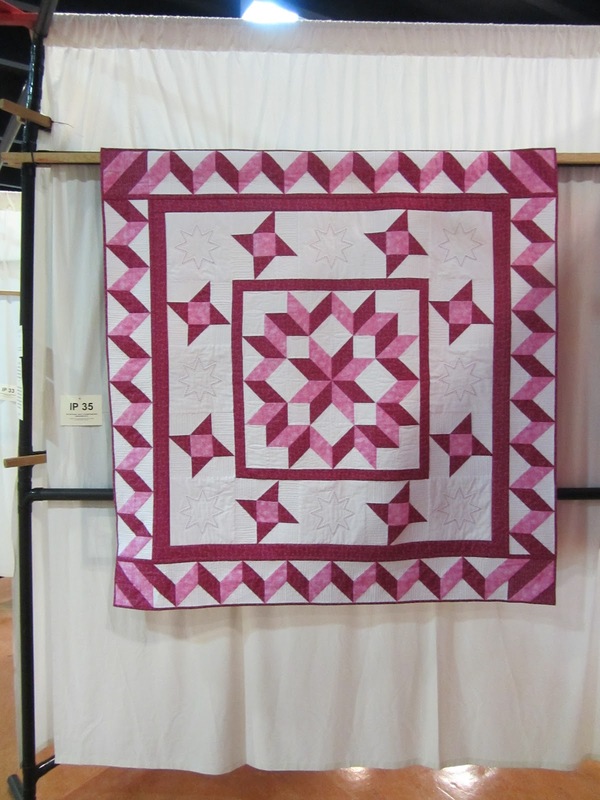 She doesn't read my blog so I think I am safe in saying she is probably the best piecer I quilt for, and this is the first time she has entered a show. 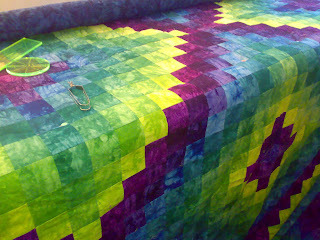 Maybe we should be thankful :) This quilt was a bit of a challenge to quilt. The fabric is a very loose weave and with the blocks on point it likes to wander about a bit. 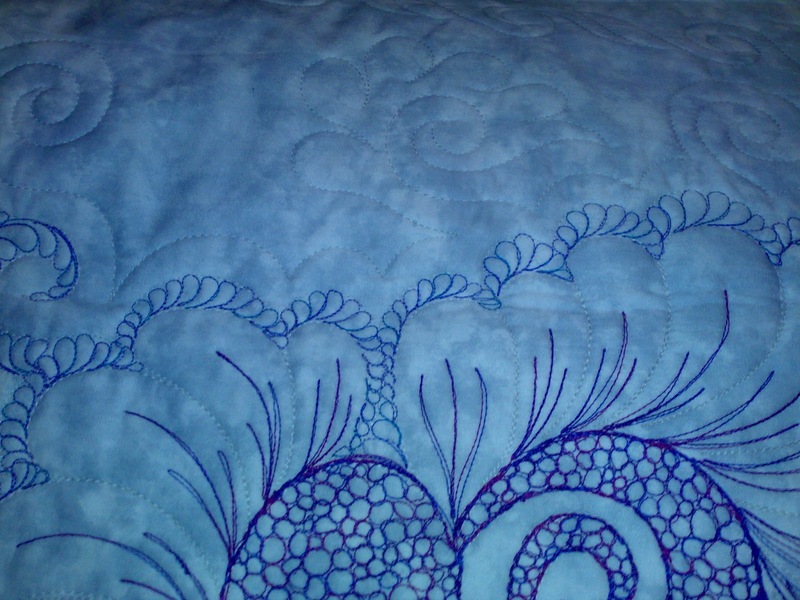 I did go a bit crazy with the quilting. 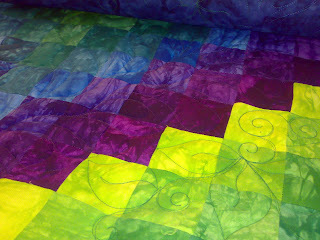 It's full on show quilting, with rulers stencils and all that fun stuff, and I loved doing it. I wish it had picked up an award, but the charity category was big and had a lot of very good work in it, so not this time. I hope Jenny can be persuaded to enter again, her work should be out there being seen by more people. I'm not sure how I should describe Angela, she wears so many hats at the shop. She is in my Wednesday morning class, teaches her own classes (from her own designs) works in the shop and demonstrates machines. 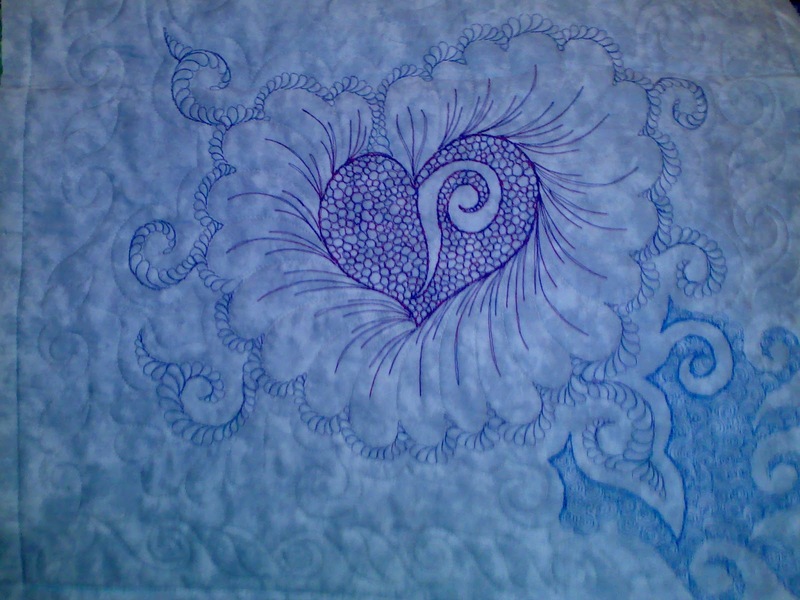 This is a quilt of her own design called 'I wish I was blue'. 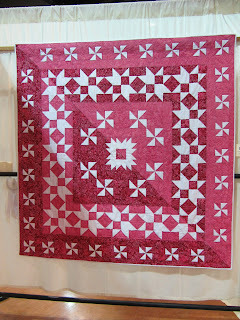 The centre was inspired by my second sampler quilt pattern which she enlarged. I don't like pink but this quilt shows how striking 3 fabrics can be when you have good contrast. 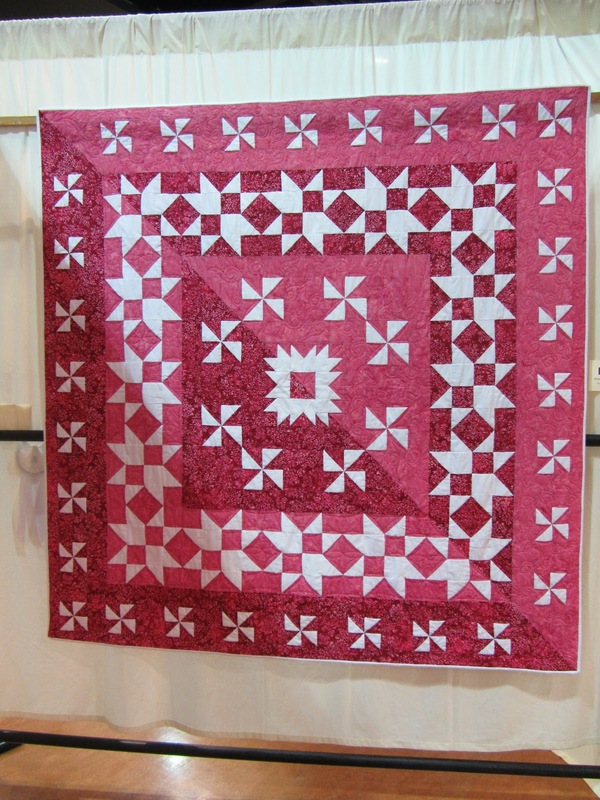 There are hand quilted stars that you should be able to see if you enlarge the image by clicking on it, and a lot of machine quilting. 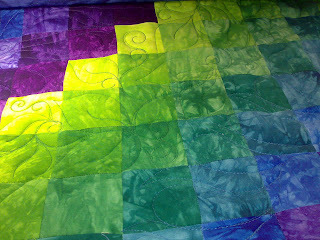 Angela has been my star example of quilting with decorative stitches for years, as she swore she couldn't do free motion quilting. 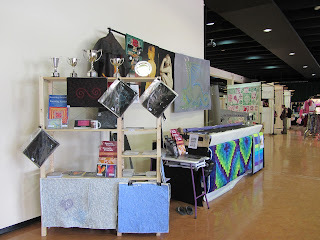 Then her students started mentioning that they wanted to learn to free motion quilt. Rather than put them off or send them to my classes (which would still have given the message this was hard and put them off) she decided she was going to master it. This is one of the great things about teaching. It's not a one way process. Your students can teach you so much both directly and indirectly if only you will let them. She is now encouraging the rest of the class to give it a go and is solidly hooked on the process. I did tell her it was fun and she could do it. I think she is now looking to try a wholecloth along with Carolyn, and several others. Gill hasn't been able to come to class this term, but it didn't get her off the hook. She still entered the show with this little quilt. She was inspired by Ashley Newcomb, from the blog 'Film in the Fridge'. She found this to be a real learning experience, and seems to have enjoyed it, even the stressful bits. 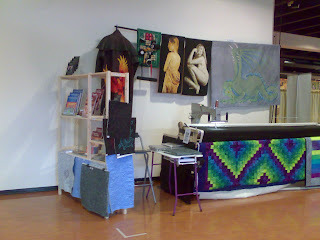 I was amused to discover that most quilters finish show quilts at the last possible minute if not a few minutes later. I thought it was just me. She also discovered that delivering quilts is fun. I haven't heard from her since we took the show down, so I don't know what she made of that. I know I really appreciated her and her families help loading up the van. Other traders were very impressed with how well they worked too. Carol Brackley comes to a class with me on Thursday afternoon and is another student who has really taken off. When I first me her, she seemed quite nervous and unsure of her skills, now she is up for anything. She plays with all sorts of patterns and fabrics producing an impressive number and range of quilts. 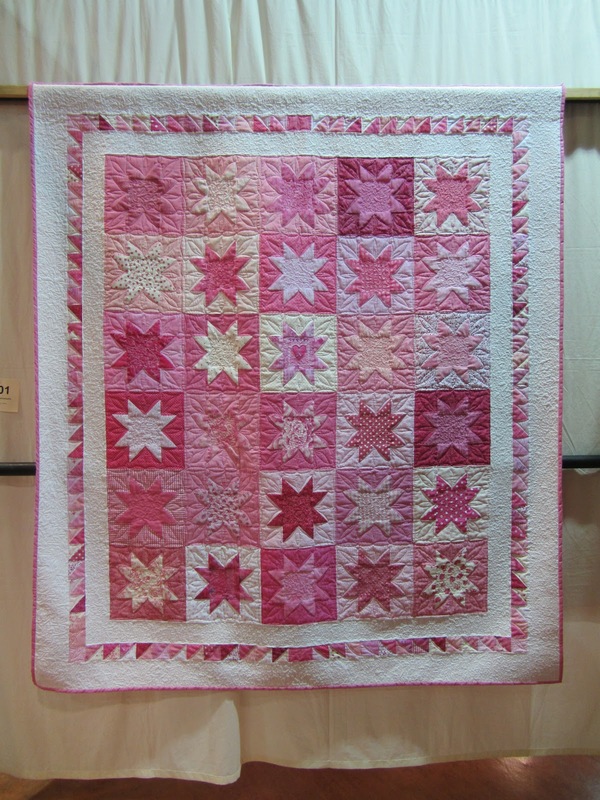 This quilt has four bows quilted into it in honour of the theme. 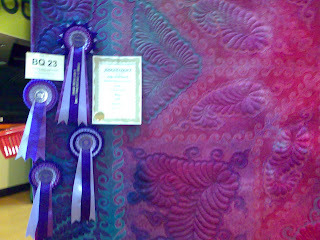 Unfortunately her family were really busy during the show, so weren't able to see her quilt hanging. I hope they will make it next year, I can't wait to see what she is making by then. So there you have it. Those are this years quilts from the Patchwork Corner crowd. 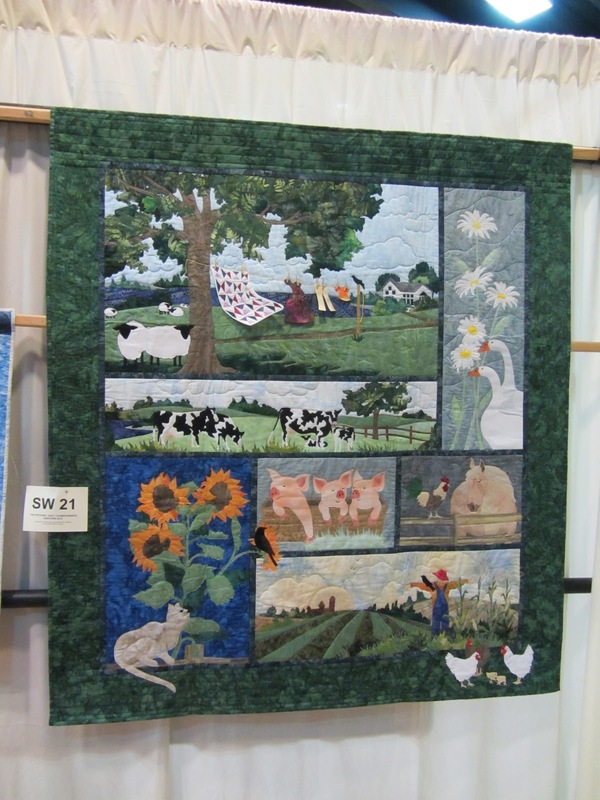 It would have been great for one of them to go home with a ribbon, but I hope everyone enjoyed the experience of entering a show and seeing their quilt hanging. It is magic just to see your work displayed in an event like this. I know a couple of these students did hear people saying nice things about their quilts and that is an amazing buzz. They also discovered that the competing bit isn't really scary, you don't hear directly from the judges unless you apply for them, and on the whole people who visit the show are pleased you entered. After all if no one enters quilts there isn't a show. I hope some of you will join in the fun next year. Somehow I never seem to end up with good pictures from the awards. I feel for Vicky who has to try and get some good pictures for the magazine. Hopefully some of the other winners do a better job of looking presentable :) Anyway, this one is Roger presenting me with the Fran Jones Longarming award. I hope she approved of the quilt. She can't come and check up on it any more, but I think of her, and the help she gave me when I was starting out whenever I see the trophy I won for Miss Baltimore. It's one of those important awards. The ones that carry far more weight and meaning than people would expect. Usually I try to get a picture with me holding the trophy in front of the quilt, but with 3 cups and a plat that wasn't going to work. Fortunately the big cup comes with a box, so that helped a bit. The ones I am holding are slipping, and slipping fast. Just to make things more fun is seems everyone's cameras were playing up, so different people have pictures from different parts of the event. I am very glad there were a lot of people with cameras and indeed phones. The first two were taken by Angela from Patchwork Corner on her phone. This next one is from Vicky at Grosvenor, she takes the magazine photos. 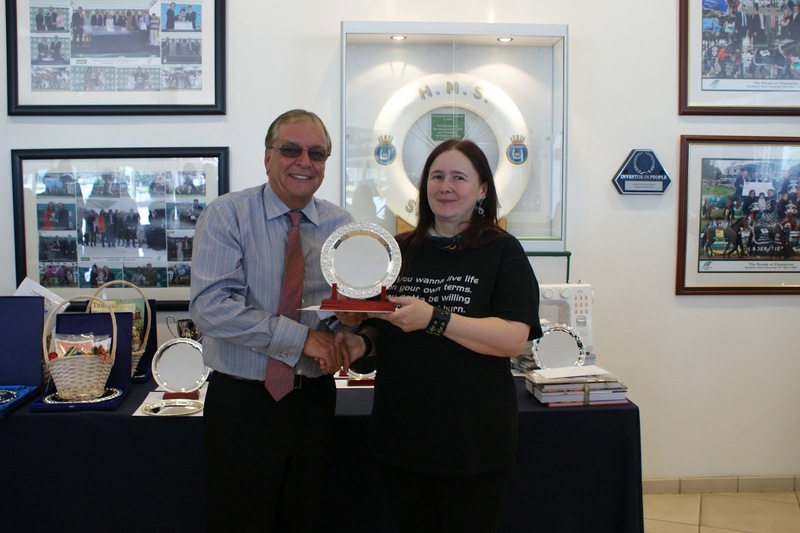 The plate is the wholecloth award and I really like the fact it comes with a stand. I still haven't unpacked my camera, though I have got the longarm back in the house so it isn't on the camera any more. For now you will have to make do with this close up of Prometheus with it's ribbons. 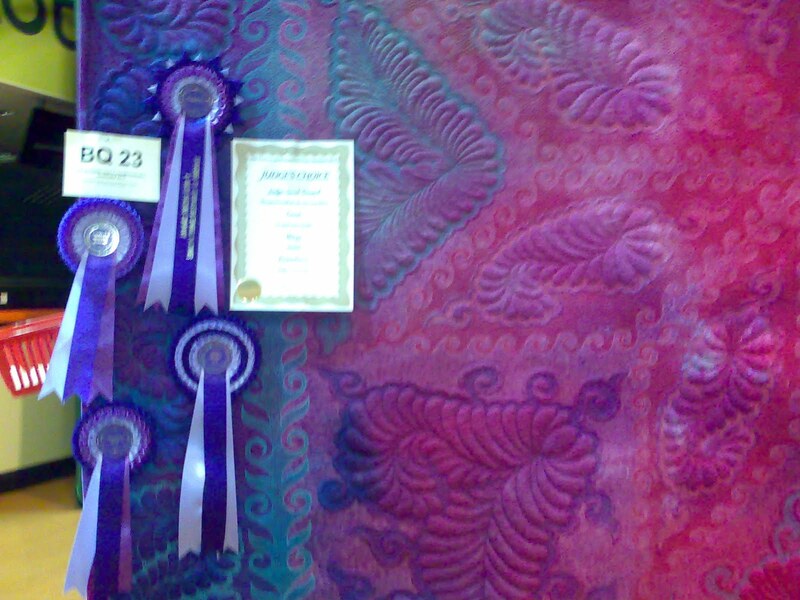 They are for longarming, wholecloth, 1st place bed quilt and champion quilt (best in show). There is also a judges choice there, but I won't risk spelling the judges name until I have it in front of me. Here is my stand at the National Quilt Championships Sandown. 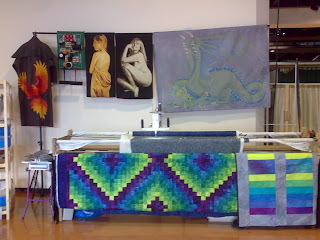 As you can see I have the longarm with me and I am quilting during the show. I've got some Ferret Bites (mini and not so mini quilts) and my new pattern. I have talked to many people today and my throat is already getting sore. Just as well I was given some Scotish candy today to help soothe it. It has been good to meet friends new and old though. 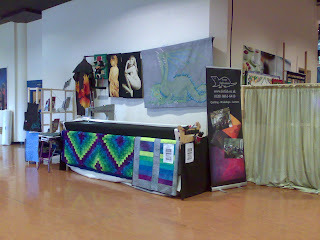 Hmm, I've just seen the images (posting from the phone) my quilt stand is looking really saggy. I hope it makes it through the show. The pieces of fabric around the bottom of the shelves are the wholecloth blanks I was talking about earlier in the week. They are like colouring books for quilters. I've given you some outlines and your job is to fill them in with whatever designs and colours you want. In the first photo you can see my new banner. I hope that will survive the weekend as I rather like it. Yes I stole the idea from the comics industry, and? It works for them why not for me :) Hanging on the front of the frame I have my first van project, which I quilted recently. I thought it would be a good splash of colour and it's proving very popular. I may need to get in some of those kits. Anyway, my printer is finally playing ball so I will have the extra signs I want for tomorrow. Then, at last, I can go to bed. 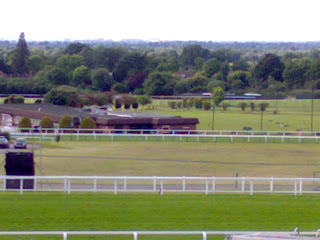 In fact from Sandown you can see a lot of London. On a sunny day I am fairly sure I can see my house. The rest of the time Wembley is about the best I manage. I don't do mornings, well not from this direction at least. I can live with being up until the early hours. However early mornings are part of the job for quilters and today is one of them. 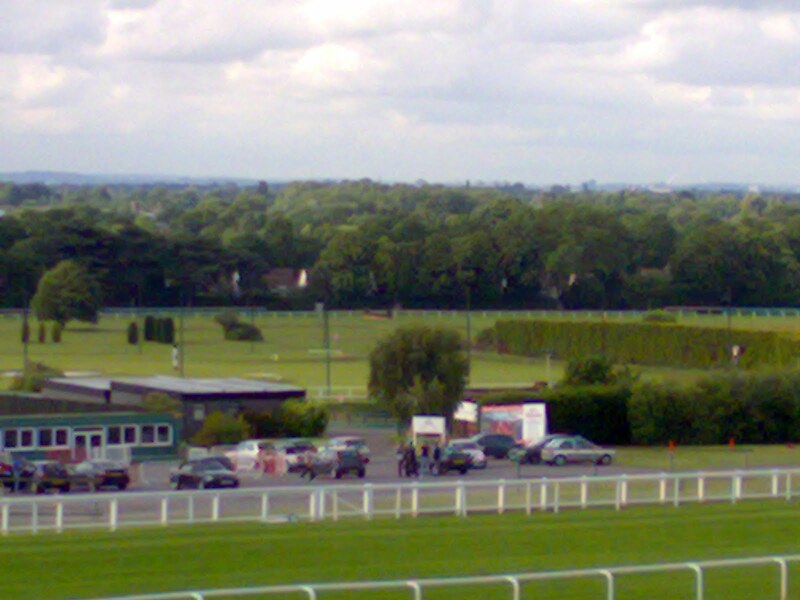 I'm heading to Sandown with my longarm to go and built my stand. It's kinda exciting. I've not done it much which probably helps. On the other hand I've not done it much so the odds are I've forgotten something. At least I will be going home during the show so I have a chance to collect things I need. The van is really full. I've got my longarm in here (yes I really am going to be quilting all weekend at the show) and quilts, and shelving and well stuff including the kitchen sink. To be fair the van always has a kitchen sink ;) I've got our passes and the tickets for my guests so I probably have the most important stuff. Now a handy tip for anyone coming to the show on Friday and using the M25. If you stay till the end of the show you will catch traffic. Lots of it. So you might like to comsider an early dinner. I discovered the Beefeater at Chessington (pretty much at the theme park) is really good. The staff are amazing, the food good and they have a big car park. 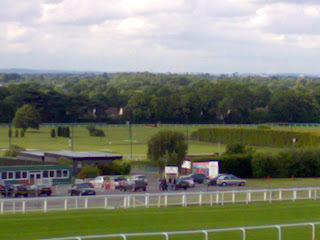 I went there on Tuesday and was impressed, it also meant I followed rush hour home instead of being stuck in traffic. Result. I've been being mean on facebook (I'm Ferret Capri there if you want to find me) and taunting people about a delivery I had today. I told folks it was a heavy box and the contents wasn't as bright as Tet had feared. I also told them it was the result of mating stars with maths, which is true in the loosest possible way. It was actually a box full of my latest pattern. You may have seen my Fractal Stars quilt at shows and Tet's will be at the National Quilt Championships this weekend, so this seemed a great time to launch the pattern. I've tried listening to what people want from their patterns, it's bound like a book. It lies flat when you open it and has a large font so you can read it while it is propped up on your desk. Lots of diagrams and full colour through out. 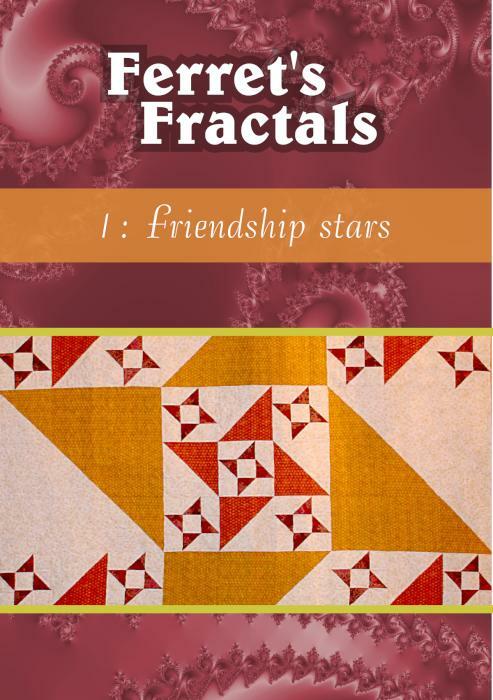 Oh and it even tells you a little about fractals. The pattern will normally be on sale for 7 pounds but just for this weekend, it will be 5 pounds at the show. We are very proud of our new arrival, and I hope you will love it too. PS. That's Tet's quilt on the cover! Many of you will have noticed that I have a soft spot where the Sandown Quilt show is concerned. 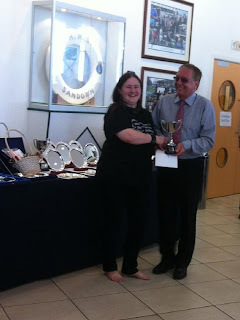 It was the first show I ever went to, entered or won at and it is my local show. Of course I love it. This year is going to be really special for me, I've got a demonstration space there, and I am going to be bringing my longarm along. This means that people will get to see that I really do move the machine about by hand. It's not the flashiest set up, but it's what I can fit in my house and it does the job. When I was at Quiltfest in Wales earlier this year I quilted lots of A4 pieces which I called Ferret Bites. They were very popular, so I will be doing the same at Sandown. They are a chance for you to buy a little quilt to use as you see fit. I know some ladies were going to make a bag with them and some were just going to put them on the wall. I think they might make good covers for folders too, but I haven't had time to try it yet. I've also made up a few (and yes I do mean few) whole cloth blanks, or bare bones. The pictures today are of one of these I have started to fill in. The blanks come with a large design stitched on them with a thread that matches the background fabric, so they are really hard to photograph. The idea is you can then play with the fun part at home on your machine, adding colour and texture. I had thought it might be a good way for students to learn the feel of the bigger designs and one came up with the idea of couching a thread over all the outlines. I think that would be great, not only would it look good but it gives you the feel for the pattern. Perfect. I was worried they may not be perfect enough as I just stitched them freehand as the mood took me. However my students saw that as an active advantage, it shows it can look good without being perfect and they felt it gave them more leeway when adding their stitching. Works for me as a plan. If they prove popular I will make more and I will consider running classes where we fill them in. It was just one of those ideas you have when you really should be getting up in the morning, but so far it seems to have been well received. One thing that has really surprised me in quilting is how much maths I teach. I love numbers and I can see now that playing number games at an early age really helped. Well it's never too late so for those of you a bit maths challenged you might like to give some of these a go. Heck if you just like numbers or fell like taking some time off serious stuff you might like them too. For my regular students I found a place to get fraction blocks and Cuisenaire rods, finally I have the props I was talking about. Although I still think the wooden ones I learned with were nicer. Every so often I reach the point where I just have to quilt, a lot. This time it was because I could hardly get to the machine I had so many quilts waiting. I'm now down to 1 customer quilt to baste and about 4 of my tops. This is good. I also have a massive pile of binding to to which I will try and have completed this week. I've concluded I really don't like the binding part much. I've had a lot of fun recently trying out new quilting patterns. My Sue Patten DVD's arrived and with the aid of my portable DVD player I've been watching them in every spare moment. One of the quilts I've just done was my turning twenty book 8 quilt. I used it as a test bed for new feather ideas. I had planned on using it for a Sue Patten style all over but it had other ideas. 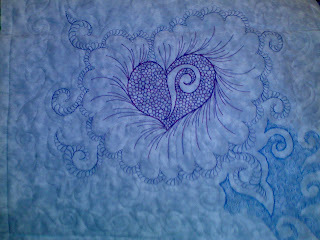 It came out well but it wasn't quick, if I am doing that for customers it's a complex pattern. Today I had promised myself would be a writing and binding day, but after two weeks long hours I haven't got much brain so I loaded another of my quilts and played. 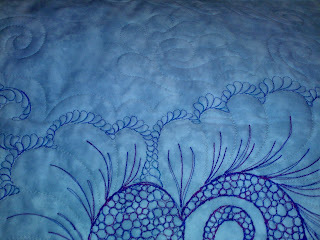 I've reached the point where I can mostly quilt on auto pilot, but today when I did have to think it took ages. I'll try and get a picture of that quilt tomorrow. 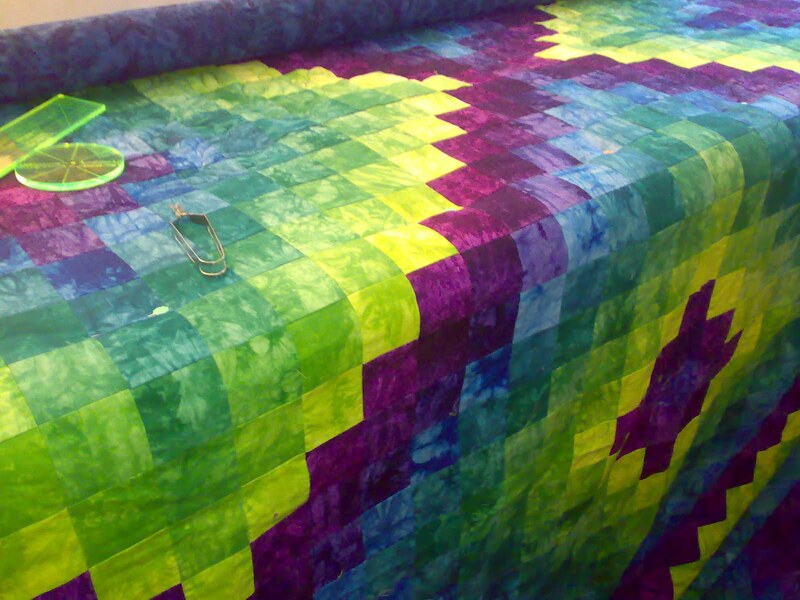 It's another quilt intended for my bed. As I used a single layer of wool in the turning twenty I decided to make this one a winter quilt. It's got a double layer of wool. I may have also been influenced by the huge bolt of wadding getting in my way :) I liked the idea of a really warm quilt with well defined quilting on that I could actually use. It seems every time I quilt something nicely it skips my bed and heads off on tour. I am sure this is very selfish, but I want a really nice quilt on my bed.